Finally a post about one of my favourite places in the world, Cornwall. My family and I always use to spend our summer holidays sunning it down in Cornwall, until Australia broke that tradition and opened my eyes to the rest of the world (see here). However in 2012 we finally decided to revisit this beautiful county. Since we’d always spend our time in the south of Cornwall, not far from Lands End, we had never explored the northern area of Cornwall, nor visited one of its most famous attractions, Tintagel Castle. 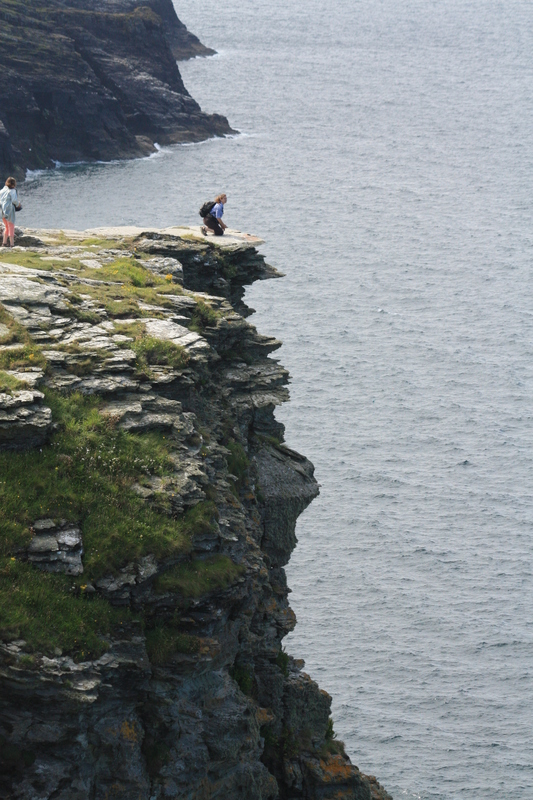 Tintagel Castle is described in Geoffrey of Mormont’s pesudo historical fantasy epic, the Historia Regum Britanniae, as the place of King Arthur’s contraception. It is said, in the book, that Arthur’s father Uther Pendragon sneaked into the castle, disguised by magic as Gloris, the duke of Cornwall. Uther then proceeded to conceive Arthur with the duke’s wife Ingraine, who remain oblivious to Uther’s true identity. The story is of course entirely fictional, but to this day the myth of Arthur continues to draw huge crowds to Tintagel, the brochures even continue to advertise the castle as the birthplace of King Arthur. 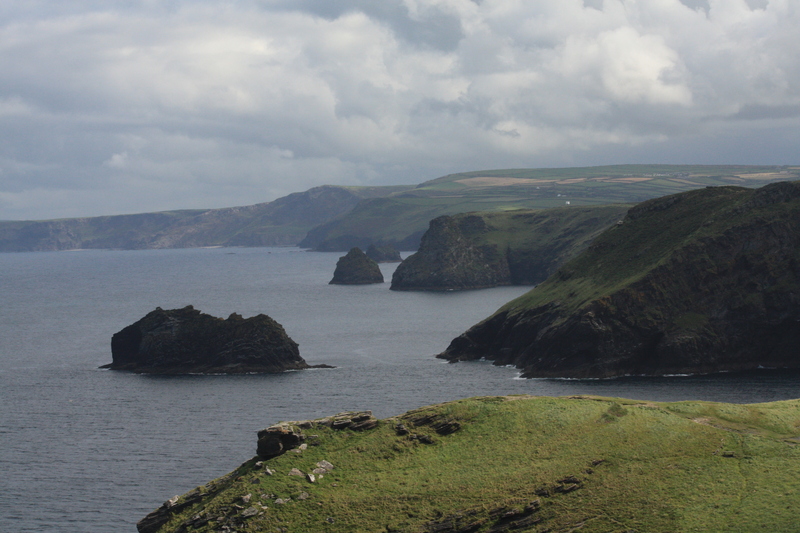 The Tintagel coastline, the land of Arthur? We decided to finally visit Tintagel as part of our journey home, we pulled into the car park just outside the old post office and followed the Castle Road which led (surprisingly) straight to the castle. Word of advice, if your ever visiting Tintagel be prepared to queue, if you do want to avoid queuing, then your best bet is to arrive early in the day like we did. Although we were through the turnstile in less than an hour, the queue behind us was stretching back up the road. Also if you don’t like heights, be warned, the castle itself is built on an island and in order to reach it, you must cross over a narrow wooden bridge that passes over the beach below. From then on you have to climb up a whole load of stairs to actually reach the castle ruins, but its certainly worth the effort. The standing castle was built in the 13th century by Richard, the first Earl of Cornwall, however human habitation of Tintagel stretches way back into the Roman era, as there is archaeological evidence to suggest that it could have been a major trading port during these times. 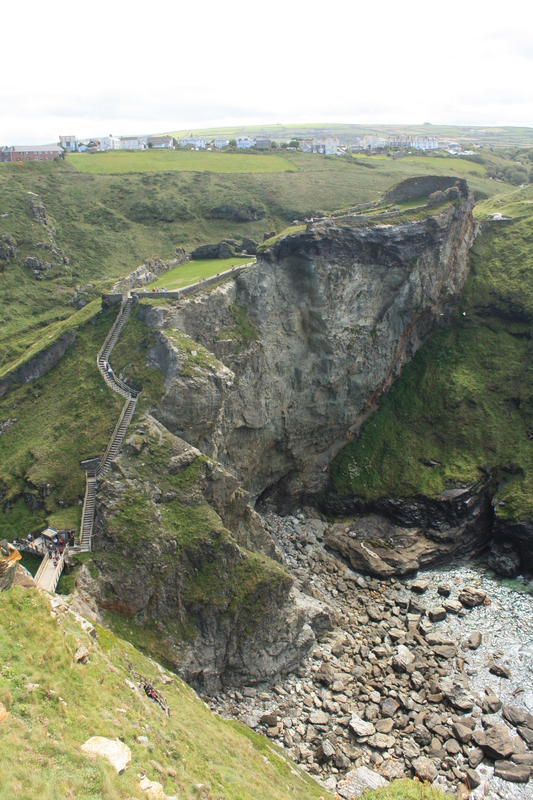 In the Dark Ages, Cornwall was its own separate kingdom known as Dumnonia, and Tintagel castle was used as a seasonal residence for Dumnonian royalty. 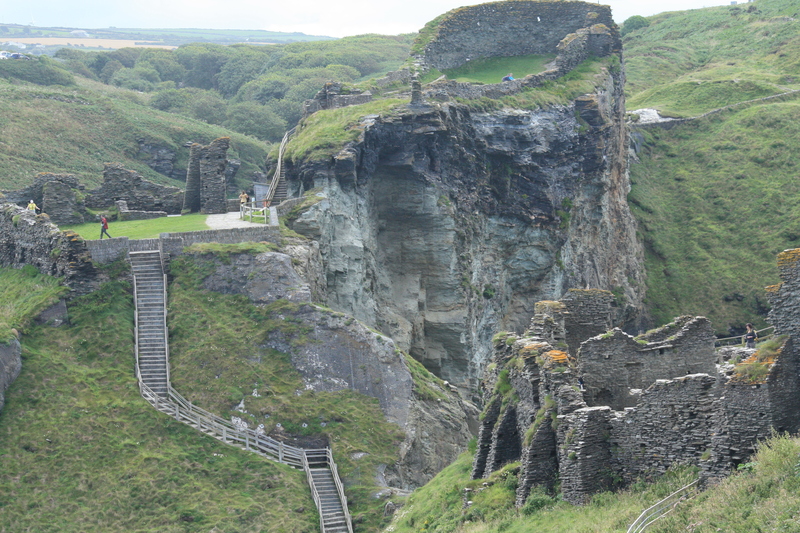 Its because of this royal connection and the Arthurian myth that Richard decided to build his castle on Tintagel Island. The castle itself had no real strategic value and was simply used by Richard as an attempt to win over the native Cornish, whom were fiercely opposed to any outsiders. After Richard’s death the castle served a variety of purposes, including acting as a temporary prison and grazing lands for sheep. Over time the castle fell into ruin, adding a romantic appeal to it. In the Victorian age, hundreds flocked to the site, drawn by its connection to King Arthur, but it wasn’t until the 1930’s that a real attempt was made to excavate the site. Even then little progress was made until a fire broke out on the headland and burn away much of the heather and bracken that coated the island. Thanks to this fire and subsequent coastal erosion, a steady stream of artifacts dating as far back as the Iron Age have been uncovered, but as of yet no conclusive evidence of Arthur has been found there (for some reason). Love your photography! I recently returned from my first trip to Cornwall and I fell in love with the place. It is so beautiful. Loving scrolling through your blog … I can pretend I’m back there! Fab pictures, and what a haunting, atmospheric place! I was obsessed with Arthur in my teens and managed to visit many of the places associated with him, but never Tintagel, sadly. I know. But although England still retains a lot of folklore, its mostly post- Christian superstition. The real mythology is lost. So rulers in history had to invent their heritage and borrowed from heroes of other cultures. It happened a lot over here too, but the myths still survived, so they didnt have to look far. I think that’s why legends such as Arthur ‘stuck’.